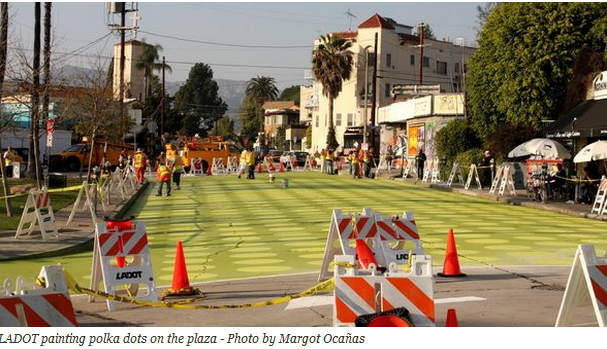 There’s been a lot of excitement, not just in Silver Lake but around the city, for the opening of Los Angeles’ first street plaza in Silver Lake this weekend. Pictures and renderings of the “Sunset Triangle Plaza” at at Griffith Park and Sunset Boulevards have been popping up at Eastsider, LAist and Curbed as well as Streetsblog. The grand opening of the plaza is this Sunday from 11:00 A.M. to 2:00 P.M. But before the plaza is opened to the public, they need our help to finish the installation. What makes these plazas such a great place to be isn’t just the green paint and polka dots, but the “park like” atmosphere including a place to sit down and some nice foliage. On Friday and Saturday, Streets for People will begin filling the planters at Sunset Triangle Plaza and we could use your help! If you are interested in volunteering for this project, please email Anna at streetsforpeoplela[at]gmail.com. Friday’s planting session runs from 10:00 A.M. to 2:00 P.M. and Saturday’s from 2:00 P.M. to 6:00 P.M.
Of course, even as we wait for the official opening, cyclists, pedestrians and cyclists are already treating the plaza as what it will be. The concept for the plaza was developed by members of the Silver Lake community in 2006. Residents saw the area as a place where a street could be reclaimed for community use rather than cut-through traffic. Drawing inspiration from programs in San Francisco and New York, the plaza will have not just potted plants; but also street furniture such as chairs and tables. It was also important to residents that the plaza not impact the popular twice-weekly farmer’s market. The market will operate uninterrupted and additional street parking will be added Sunset Blvd. to offset the spaces liberated by the plaza. During the market, the street furniture will be temporarily removed. In the other places where these plazas the media has reviewed the success of these projects by many metrics, but in Los Angeles there is one that matters. Anything that gives people more opportunities to spend more time outside is a project that makes sense. Echo Park Patch has also been covering. Indeed we were the first to announce about the need for folks to help plant. It will be a very interesting place. See you at the grand opening Sunday. Yeah, geez, Streetsblog, how dare you report the same information? Echo Park Patch has also been covering. They have been covering.